"If we can not flee to Palestine and be farmers, we will stay here and fight." With the startling amount of poor quality programming littering the television airwaves today, it is refreshing to see made-for-TV movies that match the quality of many feature films. HBO, for instance, has been doing it for years with their film division to critical applause, including the appearance of Wit on Roger Ebert's 2001 top ten list. Yet for the four major networks, it has been an entirely different story, as the movie-of-the-week or event mini-series are often melodramatic and very uninteresting. With the release of Uprising, originally made for NBC and aired during the November 2001 sweeps, my thoughts were changed, as this Jon Avnet picture packs as powerful a message as any film released in theaters in years. In September of 1939, Poland held off the German army for only one month before losing the battle for control of their home to the invading Nazis. With the ferocity of a bully, the Germans quickly commanded the country create the Warsaw ghetto as a way to contain the large Jewish population. Uprising tells the story of a group of Jewish resistance fighters who fought back against oppression at the cost of many lives, but their struggle, in retrospect, saved twice as many. Based on true events, the story focuses on the heroics of four Jews during the Warsaw Uprising. First is Mordecai Anielewicz (Azaria), the founder of the Jewish Fighting Organization, is a schoolteacher who hopes to flee to Palestine and live a free life. He is joined by Yitzhak Zuckerman (Schwimmer) and Tosia Altman (Sobieski), each of whom have different reasons for wanting out of the ghetto; he, to continue to teach and she, to live where she can tend to her ailing father. Then there is Adam Czerniakow (Sutherland), the leader of the Jewish Counsel that oversees the ghetto as appointed by the Nazis, who refuses to support the resistance, which ultimately leads to the taking of his own life. The Nazi forces are led by General Jurgen Stroop (Voight), an ultimately unsuccessful leader who failed to make good on his promise to Himmler of ridding the ghetto of these rebellious fighters by Hitler's birthday. Through ingenious planning and a strong-willed determination, the Jews smuggled explosives and used homemade bombs to stave off the German forces—for longer than the Polish army had. What separates Uprising from the pack of mediocre television films is its honest, almost intimate, way of telling the story of the Jewish resistance. From the outset of Uprising, we are introduced to each character individually and from there we see them come together, giving the viewer a greater idea of just what these fighters were up against. From then on the picture begins a breakneck pace that is consistently thrilling as well as, alternately, heartbreaking. The attention to historical accuracy that is shown in Uprising is, at best, a double-edged sword. I admire the way in which screenwriters Paul Brickman and Jon Avnet (who also directed) used real life events as a large part of the script, as well as several key sequences that are recreated as they were during the real Warsaw ghetto uprising. Yet all of this is less admirable when it is obvious that the script has several sequences that feel as if they are there only for padding or for manufactured conflicts. Throughout his career as a feature director, Jon Avnet has made films that could very well be categorized as "chick flicks," and of those films, only Fried Green Tomatoes holds the distinction of being anything more than forgettable. With Uprising, he does a terrific job of blending the story with scenes of action that rank among the best seen in any war film. If Avnet stumbles it is in places where his direction feels a bit heavy-handed. One example of this occurs about halfway through, when he shows Jewish men and women being slaughtered by the German army; he blends these scenes of terrible violence with a mass taking place in a beautiful cathedral. This worked well in The Godfather, yet here it seems unnecessary. Above the direction and screenwriting, the crowning achievements of Uprising is its production design, musical score, and cinematography. The work done by production designer Benjam�n Fern á ndez (whose work on The Others is also wonderful) is amazing in its detail and accuracy to the time period of the early 1940s. In his work on Uprisinghe has likely achieved the closest recreation of the Warsaw ghetto ever constructed. The musical score by Oscar&-winner Maurice Jarre is sweeping at times, then eerily quiet and haunting; quite an achievement for Avnet to recruit the composer of the famous Doctor Zhivago score for a television movie. 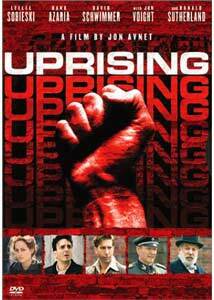 As has been the case with other event mini-series, Uprising features a cast of film stars. Hank Azaria gives the best performance in the film: empassioned, touching and often bests any work he has done in his career to this point. Lee Lee Sobieski shows the same promise she has shown in other roles in her career, here as a strong-willed woman who must care for herself as well as others in the midst of crisis. Other performances by Jon Voight, Samuel Moyer, and David Schwimmer are equally terrific. After its network premiere on November 4th, Uprising played for one week in Los Angeles theaters. I would have liked to have seen the film on the big screen, as nearly everything about it is more deserving than many films playing in theaters as I write this. This is television at its best, and is worth a look by everyone. Image Transfer Review: Presented in its original 1.85:1 aspect ration, Uprising looks wonderful. The dark grays of the ghetto are perfectly rendered as are the lush hillsides shown early in the film. This is a crisp image with no print flaws or scratches, nor are there any moments where edge enhancement is noticeable. There are virtually no elements in which this transfer fails to impress. Audio Transfer Review: As a welcome surprise, Uprising is presented in a Dolby Digital 5.1 sound mix. Dialogue is clean with no distortion, while the .1 LFE mix is active in several of the numerous battle sequences. The surround speakers are often in use with both the ambient sounds of Warsaw as well as the hail of gunfire in the latter scenes of the film. A wonderful mix, considering that the picture began life on television in Dolby Surround. Extras Review: Spread across two discs, the extra features on this special edition of Uprising are not overwhelming in size, but they certainly are in terms of information. First , there are two audio commentary tracks, one by director Jon Avnet, and the other by actors Lee Lee Sobieski, David Schwimmer, Hank Azaria, and Jon Voight. Avnet is well spoken, and it is clear that he has not only a love for his film but also a deep appreciation for the struggles of the Jewish people. He talks at length about portions that are lifted directly from historical accuracies as well as working with the actors and crew. It is a good track, but at times it is clear that Avnet has trouble covering three hours. The second track is less interesting as Sobieski talks at length about working with the other actors and about the sets, costumes, and story. She has fun pointing out problems with the sets, including one very funny moment about a particular block of bricks that was in fact plastic and how it can be seen moving within the shot. Voight, Schwimmer, and Azaria were recorded together and the three have some nice chemistry, though most of their comments involve other members of the cast. Voight talks about why he did this or why he did that in nearly all of his scenes. On the second disc, two documentaries are offered, each completely different from the other. The first is titled Breaking Down the Wall: The Road to Recreating the Warsaw Ghetto Uprising and is largely promotional in the way it features interviews with Avnet and other members of the cast. Avnet is interesting as he relates why he wanted to make the film, but some of this is just a rehash of things said on his commentary track. The second documentary is also the best. Resistance is a fascinating look at the events that inspired Uprising, featuring interviews with several survivors, as well as an in-depth look at the Resistance, this documentary is undoubtedly one of the best I have ever seen on DVD. Resistance should be seen by everyone hoping to learn more about the Warsaw Uprising, as well as anyone with a remote interest in World War II. Two trailers for Uprising are presented in full frame and Dolby Surround, while cast and crew filmographies round out the extra features. I remember standing in The National Holocaust Museum in Washington D.C. several years ago and having chills run through my body at the atrocities that took place some fifty years ago. While Uprising is certainly not the best film to deal with this terrible subject matter (both Schindler's List and SHOAH are infinitely better), it certainly deserves to be mentioned in the same sentence as those films. The new DVD by Warner Bros is also of the highest quality, as it boasts pleasing audio, video, and supplemental portions. Highly recommended.